Crocs Kids Electro Shoe Sea Blue/Lime, light weight clog, double colours - double fun! Two-piece croslite™ material moulding allows for twice the fun. 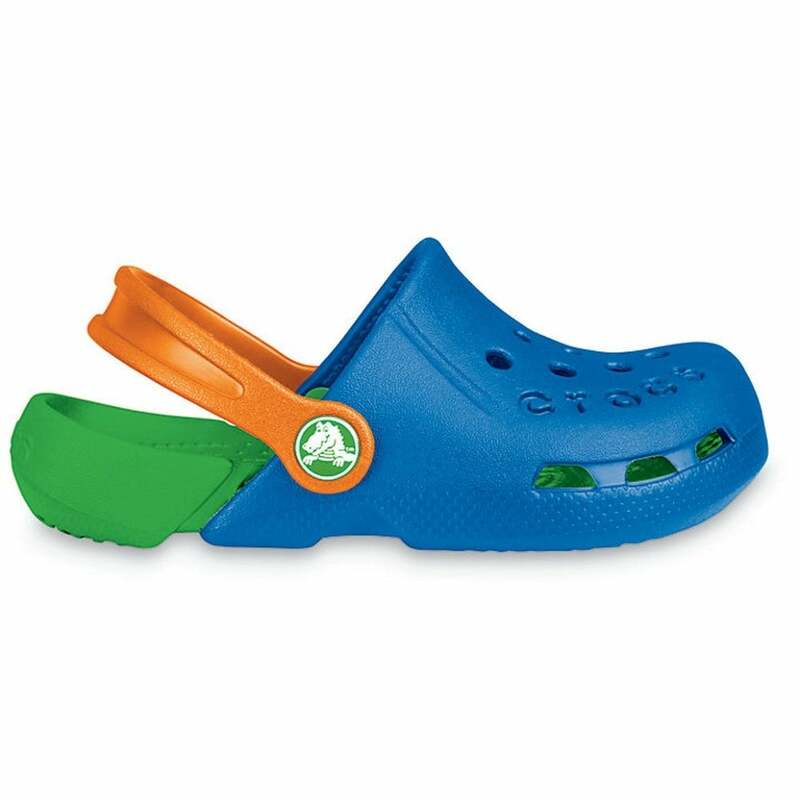 Dual-coloured with iconic holes and Crocs™ logo. Croslite™ material back strap for active kids everywhere. Just when you thought that the Crocs kids cayman was a good as it was going to get, Crocs have pulled the 'Electro' out of the bag! This funky version of the crocs cayman has all the same great quality and comfort, but has a real fun and funky twist......two tone colours & design.................and that means double the fun! Brilliant for holidays, easy to wear and light to pack, it's what all the kids want in their suitcase! Also the Crocs Electro is ideal for kicking back at home, in the garden, by the pool, at the beach.............we are struggling to think of a place you couldn't wear them! Ergonomic ergonomically certified, by United States Ergonomics, and proven to reduce muscle fatigue up to 62.6% more than standing barefoot. Anti microbial crocs shoes are made from our proprietary material, croslite. this revolutionary closed cell resin is known for its anti-microbial, properties, making them odour resistant and incredibly easy to clean (simply use soap and water). Lightweight croslite material makes crocs shoes amazingly lightweight; a fully moulded pair of crocs shoes weighing less than 10 ounces.